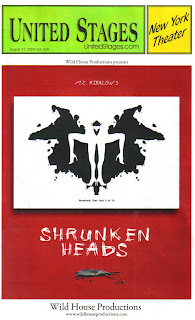 Shrunken Heads, by Wild House Productions, needs to extend! Unfortunately, it closes today at 2:00. It's playing at the Peter Jay Sharp Theater on the 4th floor above Playwright's Horizons. The press release synopses is "Dr. Bob Hyde, a successful psychiatrist, just wants to have a quiet, peaceful weekend at his country estate, where he can commune with nature and relax in his Jacuzzi, far away from his patients. No such luck. The various women in his life interfere - from his neurotic patient Dorothy Putney, to his daughter Caroline and ex-wife Jennifer - determined to drain him of all his money. Head games come alive in this fast-paced farce, where family drama plus biting wit equals 'Shrunken Heads: a case of high comedy.'" Angela Astle swiftly and efficiently directly this comedy by M.Z. Ribalow. It reminded me in a sense of What About Bob?, and was just as funny. Stephen Alan Wilson plays the exasperated and doctor with the air of self-importance and intellectual superiority. Mel House plays his younger and infinitely patient second wife, who is much wiser than she lets on. Diana Henry, riotously plays the doctor's first wife almost like she's "Vera Charles" and practically steals the show. Kim Weiler plays Dorothy, a cross between trailer trash and the Bill Murray-like patient. She's outrageously funny. Rounding out the cast are Ean Sheehy as Dorothy's jealous husband, Allison Layman as the doctor's daughter and David Gelles Hurwitz as her boyfriend. It's a quick 1 hour and 45 minutes with a 15-minute intermission and frankly, another act would not be unwelcome. The $18 tickets for today's performance are available online at www.TicketCentral.com or by calling 212-279-4200. Tickets may also be purchased in-person at Playwright's Horizons box office.